Japan erupted in joy after Naomi Osaka won her second straight Grand Slam title at the Australian Open on Saturday, with fans taking pride in the feat that guaranteed she will become the country’s first world No. 1 single’s player in tennis. In Osaka, where she was born, around 30 fans waving Japanese flags erupted in joy after watching the grueling Australian Open final on an installed TV screen at a tennis center where Osaka practiced during her childhood. “I’m deeply moved. I can only say she’s fantastic,” said 58-year-old Hiroshi Kawai, who visited the Utsubo Tennis Center with his 8- and 10-year-old children. “I think she was able to win because her serves were on target,” 9-year-old Chihiro Matoba said after Osaka beat the Czech Republic’s Petra Kvitova. He said he did not talk with Osaka before the match as he did not want to put pressure on her. “The game had many nail-biting moments and I could not move away from TV,” he said. Tennis star Kei Nishikori did not react to his compatriot’s win with words but with dozens of emojis showing thumbs up, flexed biceps, fists, trophies and Japanese flags in a Twitter post. Staff at a Tokyo showroom of Yonex Co., a sporting goods maker that as a sponsor provides tennis rackets to Osaka, also intently watched the match. A prepared panel showing Osaka’s photo and the word “CHAMPION” was put up as soon as she clinched the win. “I never thought a Japanese would win two Grand Slam tournaments in a row. I want to say thank you to Osaka,” said teary eyed Masahisa Nomura, one of the staffers. 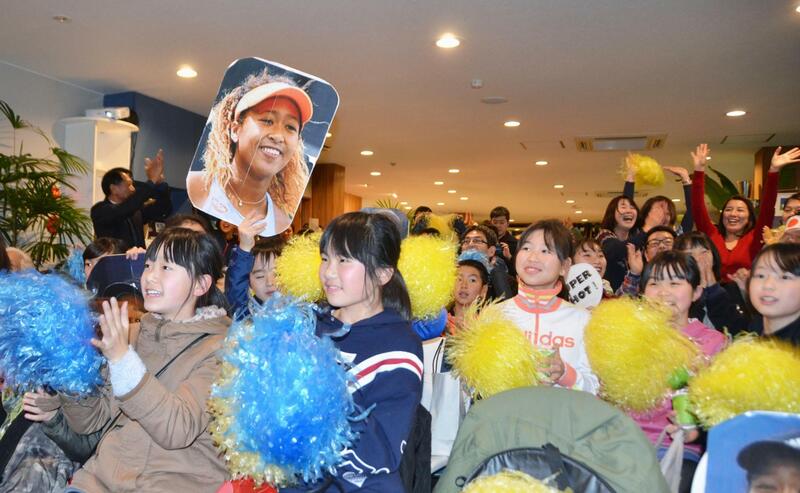 Twelve-year-old Reira Nasu was among about 100 supporters who gathered to cheer Osaka at a tennis school in Niiza, Saitama Prefecture, and basked in the excitement. Osaka “doesn’t make mistakes even if she is aggressive on offense. And she can also rebuild her game even when she is under pressure. I want to learn from her mental strength,” Nasu said. Former pro player Ai Sugiyama said Osaka has grown mentally. “Even when she wasn’t doing well, she used her time during points effectively and switched her mindset positively,” Sugiyama said.